You have to get to BATSU. What is BATSU, you ask? Literally, what isn’t BATSU? 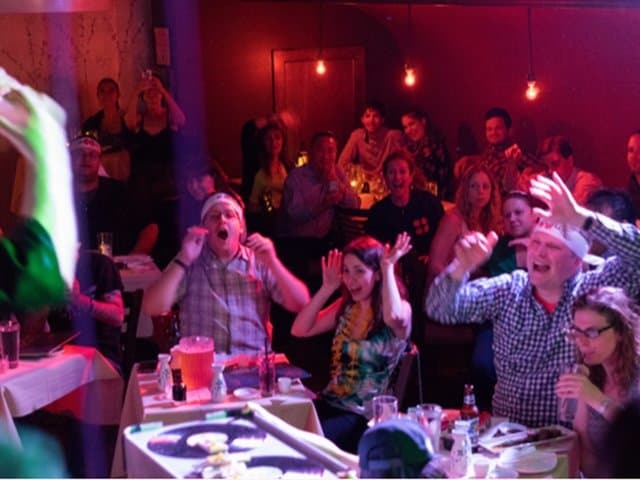 It’s a comedy show, but it’s also a game show, and a sushi dinner, and a party. Want to see if it’s right for you? (It is right for you…) Check this list below. If you like to cringe and laugh. 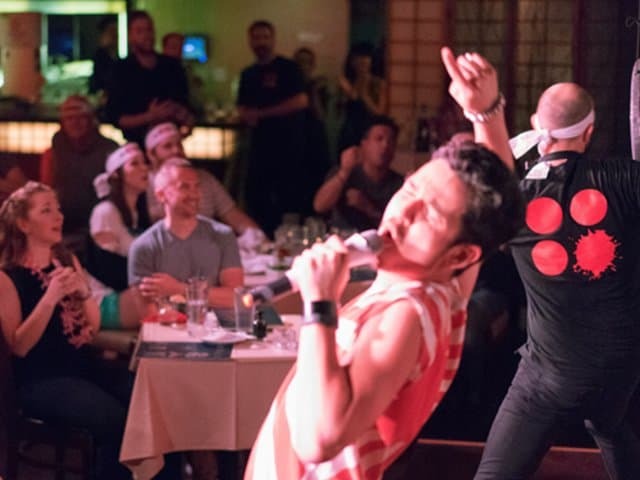 BATSU is more than just a comedy show, it’s inspired by Japanese gameshows, also called Batsu, where audiences laugh at performers who get punished after they done something incorrectly. In BATSU, four comedians play classic improv games, but if they mess up, they get hilariously humiliated. Sometimes the humiliations are funnier than the games themselves. If you like watching FAIL videos on the internet, you’ll love BATSU. If you like a mix of high brow and low brow. The people at BATSU definitely understand that sometimes you want to eat super fancy food and watch super physical comedy at the same time. Half the time you feel like a classy adult with your wine or elegant sushi, and the other half you feel like like you’re at a wild college party. It’s the best of both worlds! If you like to live dangerously. If you want to take the extra step, you can sign up to play some of the games onstage with the BATSU performers. If you win, great, you get a free shot! If you lose…well, you might get punished too. But don’t worry, if you volunteer and get chosen, you get a free beer and a ticket to another BATSU show! For free! That’s worth an egg to the face, right? If you like audience participation. There are a ton of cool ways to join in the show even if getting up on stage seems a little too radical for you. Right before every punishment, the hosts beg you to scream BATSU with them, and they’re always looking for wacky suggestions to get the comedians started. Honestly, the people at BATSU are down for pretty much any type of audience interaction. I got 5 points just because I was dancing during the breaks, and the host started a hilarious dialogue with a woman whose phone went off. If you like delicious drinks. Though most people were drinking tasty Japanese sake during the show, the fully stocked Kamehachi bar has everything you could ever want for your drinking needs. There’s even a toast at the end of every round of improv. BATSU is just like your favorite drinking game…if your favorite drinking game prominently features a guy in a giant chicken suit. If you like delectable Japanese food. Obviously, the sushi at Kamehachi is incredible. They’ve got light and luxe nigiri if you’re interested in high-quality fish, and Maki rolls, stuffed full with good stuff. 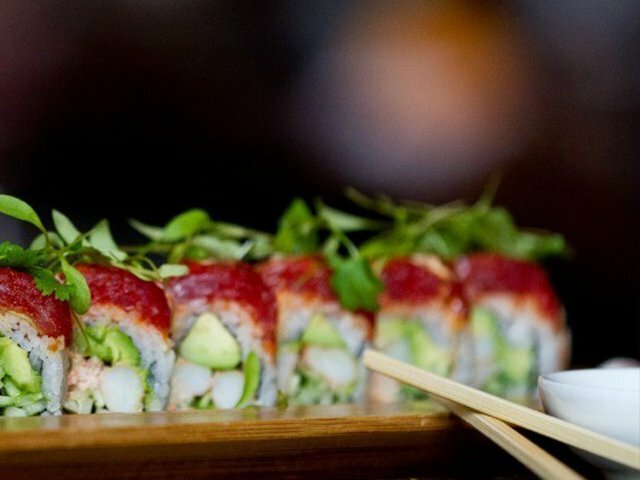 If sushi isn’t your thing, they’ve got you covered too. I got some Yaki udon noodles and they rocked my world. If you like unique experiences. Seriously. Where else will your night include world class sushi, hilarious comedy, and a paintball gun? Get to BATSU as soon as possible. Interested in snagging some tickets? Check out discounted tickets on TodayTix.